The IE Global Admissions Test (ieGAT) is an alternative accepted by many institutions to the GMAT®, GRE® or LSAT®. The test determines a candidate’s ability to make challenging, high-level decisions in a high-stakes environment for business. The ieGAT is a comprehensive exam focused on the student’s management style and making decisions. The exam is a practical exam – which presents the students with real life situations. The Erasmus Center teachers will create an individual plan to guide you thru the three key portions of the exam. 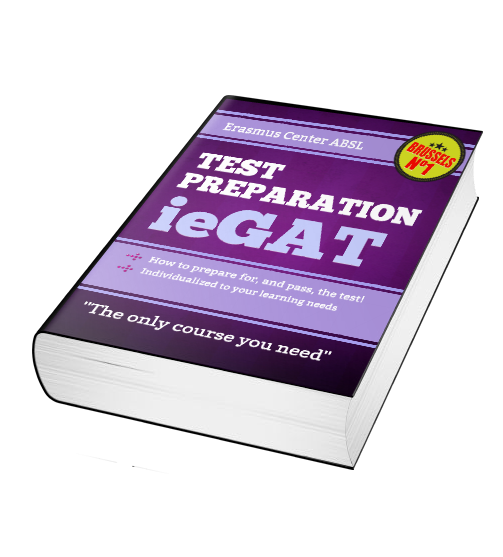 Our ieGAT preparation is individualized to your learning needs using ieGAT and GMAT® test prep materials. After a fully simulated free diagnostic exam, we will develop your tutoring plan and present the options to you for paid tutoring options. Erasmus Center also offers regular FREE Seminars on test preparation and topics specific to various exams and admissions processes. Why is a live tutor better than on online test prep? You can ask our expert instructors all your questions. The interactive Questions & Answers is one of the most important features of the Practice Exam and tutoring. You’ll get personal feedback. Because the test is about interaction, talking to a live person will give you the advantage you need to master the ieGAT exam. You’ll get professional training. Simply knowing the test material is not enough – our expert advice is designed to help you take the test with confidence. It is aimed at an international audience, with a diversity of educational backgrounds and does not favor a particular education system or area of study. Comprehension and reasoning. This section consists of text which must be read and understood. Each text block is followed by two questions regarding the text. This portion tests the student’s understanding of written English in a professional context. Comprehension, reasoning and calculation. This section consists of graphs and data analysis. Advanced mathematics is not required. Rather, participants need to think quickly and process large amounts of information and quick calculations. Logical-abstract reasoning with symbols. In this section, participants take a predetermined shape through a series of modifications to determine the final product. This section requires strong visualization skills and the ability to maintain track of multiple images at a single time. The test takes 80 minutes. A practice of two questions of each type is included prior to the test with an IE representative as part of the testing process. IE and ieGAT are terms used with Instituto de Empresa which is not associated with Erasmus Center, ASBL. Instituto de Empresa (IE) does not endorse Erasmus Center, ASBL publications, services or products.